A 43-page police report, seen by the Mail Online, by an official connected with the case, concluded her father had held her down while Shakeel raped her. 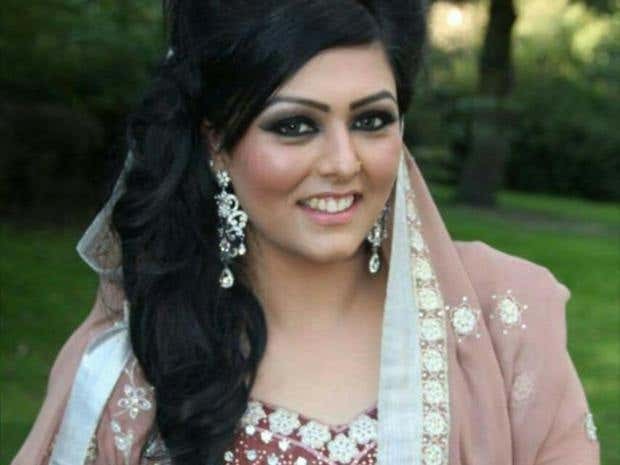 In the report, it said the day before she was due to fly to Islamabadfor the week-long stay, she texted her friend with the message: “Pray I come bk alive on 21jul my psyco cuzzan u see” – referring to her former husband. But forensic and DNA tests confirmed Shakeel, who reportedly had never accepted the divorce, had raped Samia: “The result indicated a perfect match, thereby establishing that the victim was raped by accused Shakeel before she was murdered,” said the report. The forensic report also showed a 19mm cut across her neck from where she had been strangled. The report claimed Shakeel was angry at the divorce and felt she had “dishonoured him and his family”. They had originally married in Pakistan in 2012 where she stayed for a short time before going back to the UK. She then divorced him ex-parte two years later and moved to Dubai to be with Mr Kazam.